(Nanowerk News) It isn't cars and vehicle traffic that produce the greatest volumes of climate gas emissions – it's our own homes. But new research will soon be putting an end to all that! 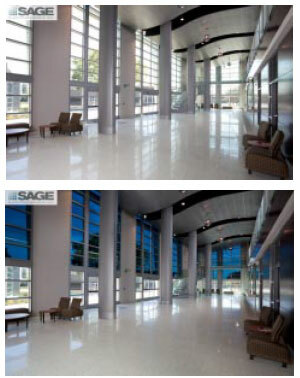 Electrochromic windows are already on the market. They are frequently called 'smart' windows. Research Director Susie Jahren and Research Manager Petra Rüther are heading SINTEF's strategic efforts in the field of future construction materials. They say that although there are major commercial opportunities available in the development of green and low carbon building technologies, the construction industry is somewhat bound by tradition and unable to pay for research into future technology development. "The strategic process currently being driven by SINTEF Building and Infrastructure and SINTEF Materials and Chemistry allows us to position ourselves to assist in the industry's development while at the same time also giving it a boost", say Jahren and Rüther. "Our researchers are working hard to produce innovative ideas about the directions future development might take. Then we check to see if the ideas they come up with are viable from a cost-benefit and environmental perspective", they say. "Our aim is to create a low thermal conductivity construction material ", says Tilset. "When gas molecules collide, energy is transferred between them. If the pores in a given material are small enough, for example less than 100 nanometres in diameter, a molecule will collide more often with the pore walls than with other gas molecules. This will effectively reduce the thermal conductivity of the gas. So, the smaller the pores, the lower the conductivity of the gas", she says. In the future, nano-insulation materials such as these will enable us to reduce existing insulation material thicknesses. The mats will probably be more expensive than current products such as 'Glava', but will offer a better option in situations where space is at a premium such as in protected buildings where there are restrictions on making modifications to facades. They also work well as insulation materials for oil pipelines and industrial tanks. "We reckon that this will become part of the Norwegian building tradition", says physicist and SINTEF researcher Tore Kolås. "However, we will also be developing the construction materials so as to optimise their ability to adapt to Norwegian daylight conditions where the sun is low in the sky and solar radiation commonly diffuse", says Kolås. "Our aim, purely and simply, is to develop systems that are so effective that it will be natural for developers to consider them when evaluating building materials in the design phase. Technologies involving thermochromic, photochromic and electrochromic pigments can help us to control how sunlight enters our buildings, all according to our requirements for daylight and warmth from the sun. And with energy savings in mind, it may also be useful to employ materials that both absorb and release energy. So-called "phase-changing materials" offer this possibility. "Another possibility is the use of electrochromic coatings", says researcher Bjørn Petter Jelle. "This is a controllable technology made possible by applying an electrical voltage to a window. Users will be able to fix the level of solar radiation entering a building. This contrasts with adaptive technologies which adjust their function to ambient temperatures and other environmental factors. In the case of thermochromic windows, the glass changes colour according to the temperature, whereas photochromic windows change colour in response to changes in solar radiation intensity. Adaptive technologies enable us to decide the degree of adjustment as determined by temperature variation and the level of intensity of solar radiation. Jelle says that electrochromic windows are already on the market. "They are frequently called 'smart' windows. Other non-traditional approaches used in windows as a means of exploiting external factors include the use of aerogel", he says. The objective of the project is to produce concrete that can be 'restored' after being exposed to loads and stresses by means of self-healing agents that prevent the formation of cracks. The method involves mixing small capsules into the wet concrete before it hardens. These remain in the matrix until loads or other factors threaten to crack it. The capsules then burst and the self-healing agents are released to repair the structure. "We've carried out stress tests to measure both static and impact strength", says Huaitian Bu at SINTEF Materials and Chemistry. "And we've now developed a technology called FunzioNano® by which we can manufacture hybrid nanoparticles which will improve the properties of the shells", he says. When passive houses become the standard in Norway, house building will become more expensive, regardless of the materials chosen. For this reason, some people believe that in ten years' time an increasing number of private homes will be built in concrete because this material has thermal properties that promote optimal energy efficiency.